Researchers have suggested for years that primates are more developed at birth than humans because we walk upright. Upright walking was thought to limit the size of the birth canal. In theory, if the birth canal was large enough to handle a larger head (or larger brain) it would hinder upright walking. According to new research, this theory is not based on sound fact or clinical research. Women with wider hips do not exhibit difficulty walking upright and metabolism may just be the controlling factor in human gestation. Growing a fetus takes tons of calories. Expecting women increase calorie intake by about 300 calories a day, if they are following the general obstetric guidelines, for a singlet pregnancy. These extra calories are used to supply the energy needed for placental development, uterine growth and fetal growth, but there is only so much the human body can handle. 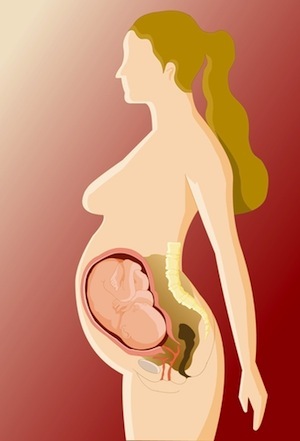 Holly Dunsworth of the University of Rhode Island claims the human body stops gestation and starts the labor process when a pregnant woman’s body reaches the metabolic limit. The metabolic limit is the point at which the body can no longer spend any more energy, safely, on the growing fetus. The body triggers labor because further growth would place undue strain on the pregnant woman. This theory is in direct contrast to theories that claimed hip breadth limited gestational age to 40 weeks. The new theory is called Energetics, Gestation and Growth or EGG for short. The basic premise is simple. Mom carries the fetus until her body is about to cross into the metabolic red zone and then labor starts. EGG is not based on the amount of calories a woman takes in during pregnancy, but the amount of calories her body can transform into energy and burn for fetal growth. The body is limited to a certain ceiling of calorie burn and when gestation causes the body to near that ceiling the signal is sent to deliver the fetus. Further research is needed to reinforce this new theory, but researchers involved with the study are convinced that hip breadth has nothing to do with gestational time. Source: Holly Dunsworth, Anna Warrener, et al. University of Rhode Island. August 30, 2012.